Sometimes you need a high power common mode choke that is super effective and the Super-Choker™ products fill this need very well. All Super-Choker™ chokes use multiple turns through ferrite cores for higher choking impedance compared to our multi-bead sleeve chokes which only use one turn through multiple cores. Different ferrite mixes and turns ratios are used to optimize choking impedance in the selected product frequency range. 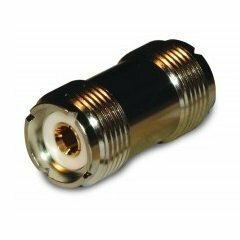 Super-Choker™ chokes are manufactured with 1/2″ 52 ohm coax cable (rated for full amateur radio legal limit of 1500 watts continuous (or the capacity of the coax cable at the selected frequency – good for over 5KW on 4 MHz into a matched load for example) with PL-259 connectors that can be connected to your coax feed line with simple double female barrel connectors. Super-Choker™ chokes are ideal for high power stations and are very effective for keeping common mode current off the feed line on verticals, dipoles, and loop antennas at their feed point and also for choking coax lines at the station input to reduce common mode noise picked up by the outside of the coax braid between the feed point and the station entrance. Ferrite core kits are available separately if you want to supply your own coax feed line. I run an 80 meter loop antenna about 30 feet in height and have previously been using a coaxial balun common mode choke of 25 turns of RG-213 on a 6 inch form attached about 6 feet under the corner feed point of the loop (configured in a triangle). Using a Dentron 3000 antenna tuner I was able to tune all the ham bands and the lowest SWR was about 1.4 on most bands. The antenna feed line was led away from the corner of the loop and was not under the loop. Feed line length was about 105 feet as measured on the Aim 4170-TDR function. I first placed a Super Choker™ 8010 at the antenna tuner leaving the coaxial balun in place. As I retuned the antenna tuner, the first thing I noticed was that I could now tune down to 1.1:1 on 80, 40 and 20 meters and I could not do that before. The noise level which had been running about S7 on 40 meters during the day had dropped to about S6 on my TS-870 receiver. I was pleased that the reflected power was now almost nil and the noise level was lower. I then took the next step and replaced the coaxial balun and Super Choker 8010 with a Super Choker™ 16040 in series with a Super Choker 4010 for maximum choking power from 80-10meters. The antenna tuning was about the same but now the SWR was 1.0:1 on 80-10 meters and the noise level on 40 was down to S5. I tuned up on 20, 15 and 10 meters and worked a couple of JA’s and noticed that the noise level on 10 and 15 was not even S1 – something I had not experienced before on the 5 acre plot of land we call home. What a welcome relief to find such a simple solution to RF feedback I had experienced and I got a lower noise level to boot! Now to plan that 160 meter loop! I wonder what Krusty ole Kurt would use?